Existence of synagogue at Western Wall 'a blatant violation and genuine provocation of the feelings of the Palestinians', says Grand Mufti . Sheikh Muhammad Hussein, the Grand Mufti of Jerusalem, condemned the inauguration of a new synagogue in the Western Wall tunnels earlier this week. 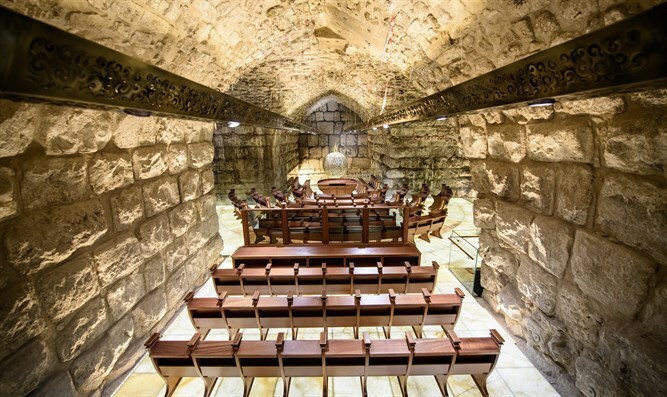 The magnificent synagogue is the result of 12 years of infrastructure work, construction, and careful archaeological excavations, in which activities were carried out in order to maintain and preserve the impressive cavern in which it is located in the tunnels. The synagogue is located opposite the 'Great Stone' [also known as Herod's Great Stone] in the Western Wall tunnels, near the site of the Holy of Holies. According to Hussein, the dedication of the synagogue constitutes a "blatant violation and genuine provocation of the feelings of the Palestinians" and "an attempt to wipe out Islamic history and to imprint the false Jewish seal in the region." He said that Al Quds, the Arabic name for Jerusalem, and the Al Aqsa Mosque are purely Arab-Islamic, and the attempts to "legitimize the occupation" are baseless and in violation of international law. "We emphasize that Al-Quds is an inseparable part of the occupied Palestinian land and there is no legitimacy for the existence of the occupation in any part of it," Hussein said. The original Arab name for the Temple Mount, however, is Bayt al-Maqdis, a clear derivative of the Hebrew Bayt HaMikdash - the Home of the Holy Temple.